A couple of days ago, Instagram founders were announcing they were leaving the company, due to misunderstandings, but it seems that the social network is continually bringing new features for the desktop app. Instagram is slowly turning into a desktop app as well. If at first, you were only able to see posts, like and comment on them; then you were able to swipe through stories, it is time now to receive notifications if someone followed you or commented on your posts. This is what in-browser notifications for Instagram are about. How does the new Instagram for Desktop feature work? 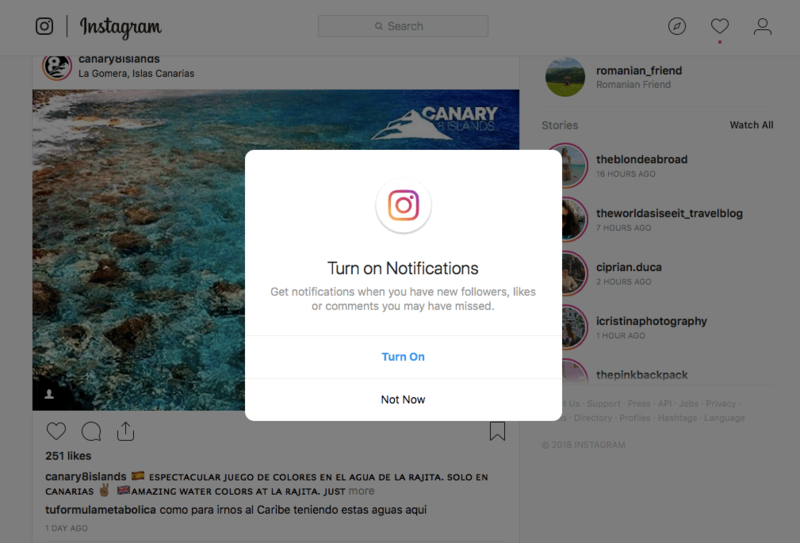 If you open Instagram in your browser, you will see a pop-up notification that asks you if you want to receive notifications about things you have missed if you didn’t open the app on your phone for a while. Once you accept to turn on the desktop notifications, you will be notified about people that followed you, liked your posts or have commented on. The update runs on most of the browsers, including Safari, Chrome, and Firefox. However, if you want to upload new posts or stories or talk to your followers, you will still need to use the mobile app. Those actions are not yet available on the desktop. Unless you know some tricks or use special apps to do this. If you are a Mac user, you can use Flume, a web extension for Instagram. On its free version you can DM your followers, but if you upgrade to the Pro version, you will also be able to upload photos directly from your device. We think that this update comes from the need of users to not pick up the phone everytime a notification appears on the screen and to be more comfortable to use the desktop version of the app. To be honest, I personally can’t wait for the Instagram desktop app to bring the upload photo and DM feature, so I don’t have to use other extensions or tricks to do this. How about you? What do you think about the changes Instagram is working on for the desktop app?